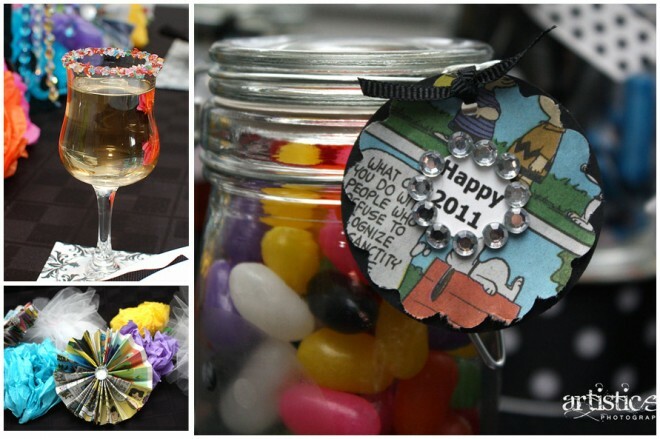 Amanda's Parties To Go: Kids' New Year's Party Tablescape Challenge! 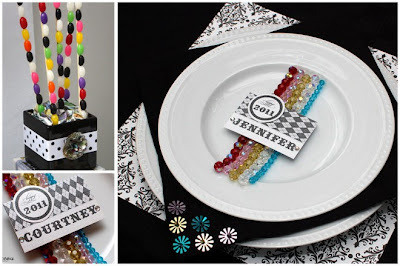 This last fall, just as I was opening my Shindig Parties TO GO shop on Etsy, I decided to join a FABULOUS team of designers in a NEW YEAR'S EVE Children's Party Table Challenge. It was EAST against WEST....... a great group of party planners and designers from all around the country playing a fun little game of "Who's party table is better?" Living in the heart of the South, it felt a little odd to be called an EASTIE, but once I started receiving some of the photos of everyone's work, I was elated to be a EAST Coast girl. Kristy, from The Purple Pug, was our team leader, and somehow miraculously organized all of these women and all of their designs into these amazing tables. Kudos to our "Purple Leader" -- she did a FANTASTIC job! I wish I could have had time to post these great photos before New Years, but I think they will provide inspiration for all kinds of parties, from kids' parties to adult parties.... just take a look. your guests a little glimpse of the fun in store. And we used these fabulous little glitter chandeliers -- did you see them for only $2.50 at Target last Halloween? They were selling out as soon as they got them out of the box and on the shelves. Kristy from The Purple Pug added a little of her glittery magic to the "drops". Let's start with the feature of any party table -- the cake. I'm loving this simple but chic cake bunting. This is such a great idea.... have your local bakery make a plain white cake and embellish it with all sorts of fun items to coordinate with you party. Bunting is so simple to make.... a couple of skewers or lollipop sticks, small ribbon, some cut triangular pieces of scrapbook paper or cardstock and wah-lahhh. 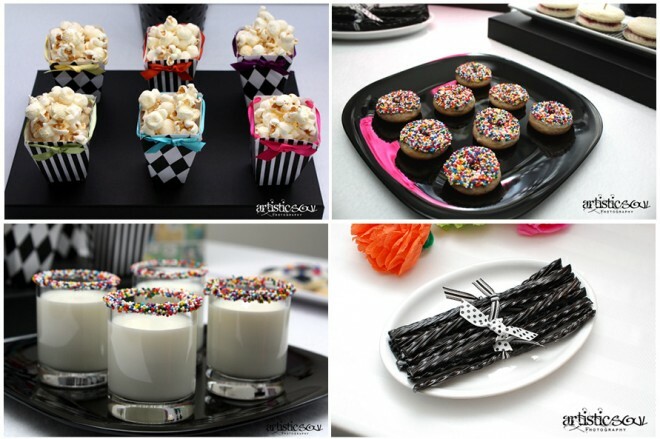 And how about this adorable marshmallow treat sticks from Stix-n-Pops - so cute! And blinged cotton candy cones, too. Just look at these adorable pop-tart cozies. I love all this creativity..... how you can turn the everyday into something really special with just a few simple touches. shot glasses of milk rimmed with chocolate and nonpareils. and sweet blinged comic tags on jars of jelly beans welcoming in the new year. One of my contributions was the cute and blingy clock -- you can't have a New Year's party without a clock. 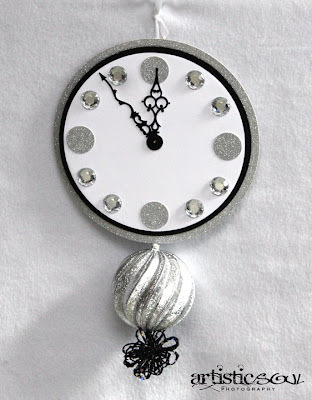 I took an unfinished round wood piece from Hobby Lobby, covered it with glittery silver scrapbook paper and white cardstock, then added circles of the glittery silver paper for the 12, 3, 6, and 9 spaces on the clock. I used purchased clear gems (also from Hobby Lobby) and glued them on for the other number spaces, and I purchased the clock hands and inserted them in the center. Then I used some ornament picks (Hobby Lobby) and made the clock pendulum. It was easy and quick, too. How fabulous is this menu card? I love the twist on an elegant dinner party, yet it's for kids. My 11 year old and her friends would just die to have a party like this. And another my contributions, a lighted fabric garland. It was pretty simple, although a little time-consuming, to make. I used two strands of Christmas lights together and cut strips (approximately 3" x 19") of fabric in many patterns and tied them onto the lights. Embellished noise-makers - as if the kids don't make enough noise on their own! But aren't they perfect for a kids' New Year's party? I thought Kristy's addition of the Light Bright was ingenious! 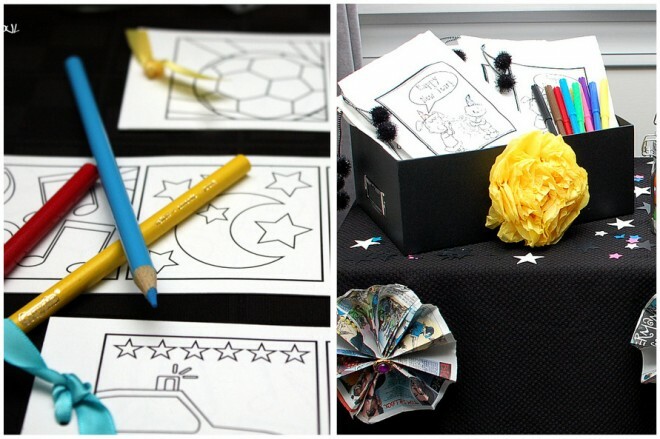 these coloring sheets and markers are great for all ages. I was honored to be a small part of this AMAZING team -- it was great fun and money was raised for a good cause, too. If you'd like to see more photos, check out Courtney from Pizzazzerie's post here. THANK YOU for your dazzling input. I am your biggest fan. You ROCK! It was such a fun contest! Amazing how such a beautiful party was put together by woman all over the East Coast! Thanks to Kristy for organizing it all, and thanks to Team East Coast who designed such a fun party! It really is amazing, and especially how Kristy pulled it all together in the end. I say it all the time, the internet is so unbelievable! So cute. I love all th embellishment. Who would of ever thought. The clock is perfect. Our annual New Year's Eve party is pretty low key with an Oyster Roast and Bon Fire but it could stand a little jazzing up. Bookmarking this for next year!! Great job ladies! Kristy did so much to pull everything together...and it was such a great collaboration! I loved your lighted garland! This is the most adorable thing I've ever seen. We had our grandchildren over for New Year's Eve. Since we live on the West Coast, we could watch the countdown in New York at 9pm. (Took the clock out of the room for the oldest one who know how to tell time.) Everyone was home in bed by 10. If we do this again, I'm copying all these ideas. Fantastic idea. I like this brownie theme for a new year party and going to follow next year. You came up with perfect embellishment. Amazing work, I like and appreciate your efforts.